More than 29 million Americans live with diabetes, that’s 1 out of 11 people! Unfortunately, by 2050 the prevalence of diabetes is predicted to increase to one in three Americans, according to the Centers for Disease Control (CDC). There are two main markets for diabetes care products: testing/monitoring products or therapeutics. These two categories can be broken into many sub-categories that address different aspects of diabetes. Diabetes products in the US market are primarily comprised of lancets and test strips; blood-glucose monitors; insulin; insulin pumps; syringes; and other insulin-delivery devices, as well as anti-diabetic drugs. It is expected that growth in the diabetic care products market will cluster around continuous blood-glucose meters; insulin pumps; and anti-diabetic drugs. With the myriad choices and alternatives being developed for diabetes care, manufacturers and developers will likely carry out market research studies before launching a new product or drug. Recruiting study participants with diabetes or pre-diabetes can be challenging, as there are different protocols that apply to health-care studies than to general market studies. Additionally, diabetes studies are difficult to enroll as there are often hundreds of diabetes trials happening concurrently. Ensuring quality outcomes for market research studies requires recruiting participants that reflect the geographic and demographic diversity of the subject. Recruiting for diabetes studies is no different. Diabetes patients are a diverse bunch, and any recruitment effort should reflect that. According the American Diabetes Association, there are more than 200,000 people age 20 and younger who are living with diabetes; more than 12% of people between the ages of 20-65 have diabetes; and more than 11 million people age 65 and older have diabetes. Recruiting strategies amongst this diverse population must include different strategies. Diabetes affects people of all ages and knowing how to target the different populations is important. Over the years, Focus Insite has built up a database of potential recruits that can populate studies that are focused on diabetes care. Our commitment to participant privacy and stringent screening protocols gives market researchers peace of mind that an essential component of their study will be managed in a professional way. 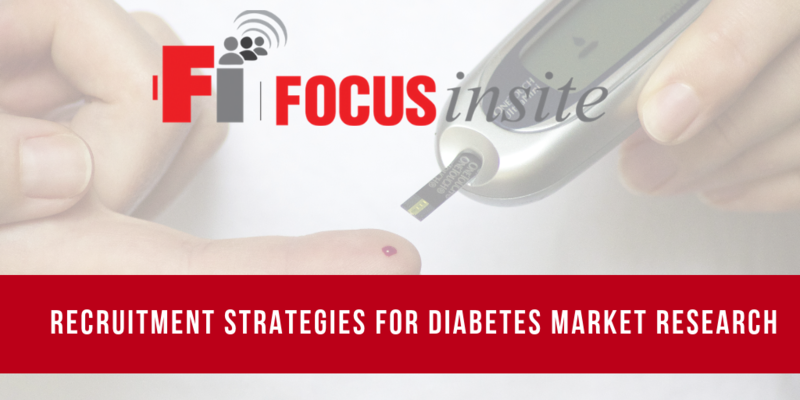 To see how Focus Insite can help you recruit for your next diabetes study, contact us today.